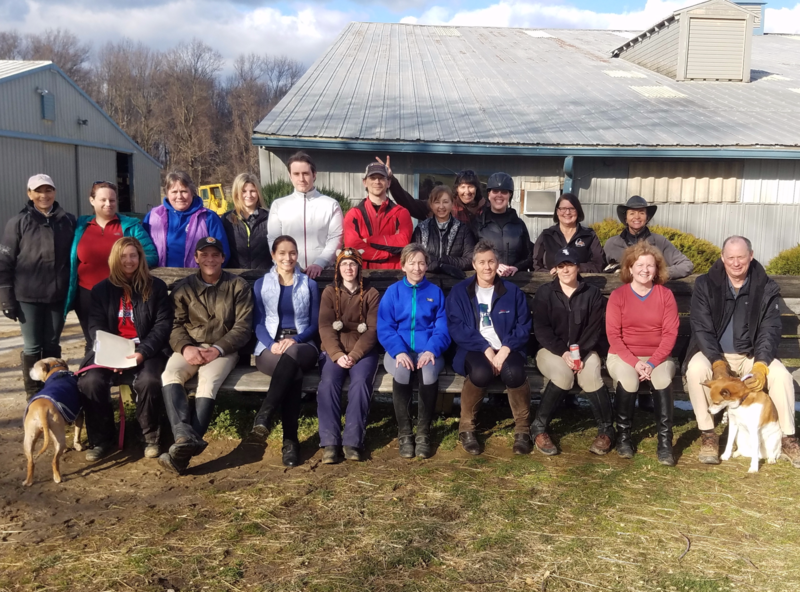 We are a complete equestrian facility offering English riding lessons in Hunt Seat, Dressage, Eventing, and Balance Seat for children and adults, beginner through advanced. 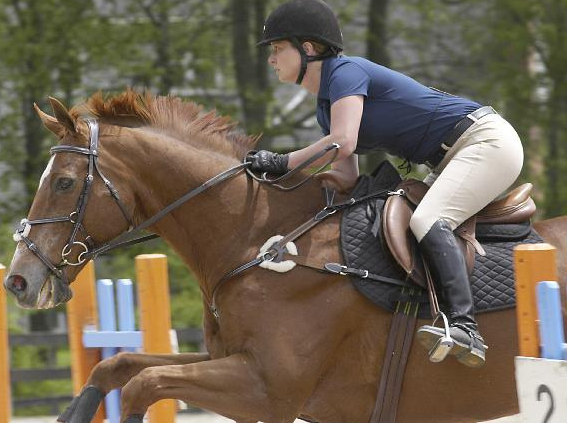 We also offer the Equi-Lease Program, camps, boarding, shows, horse sales, and much more. It is important to us to have a safe and friendly environment for riding as well as a family atmosphere for young people to enjoy and adults to take a break from the real world. Conveniently located between two great cities, Baltimore and Washington. Remember to dress in zip-up layers when riding. No scarves. Never know what to buy for someone that's interested in horses? 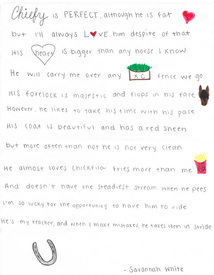 Not sure where to go to find something for them that's horse related? Well, let's make this easy for you. 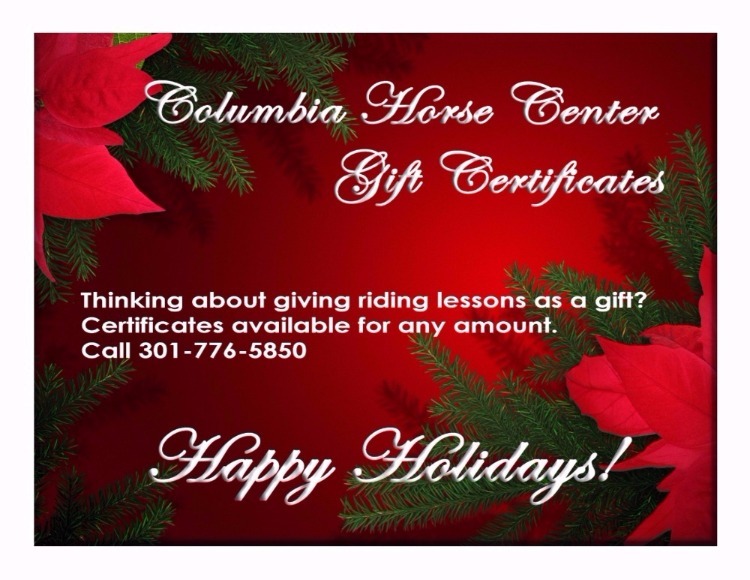 Just call us for a gift certificate that can be picked up, mailed to you, or mailed to your recipient. You can do a dollar amount that can be applied to lessons, camp, or shows. We also can do lesson packages. It's easy and hassle free. • The web-site, Facebook, & Twitter will always be updated for closings. 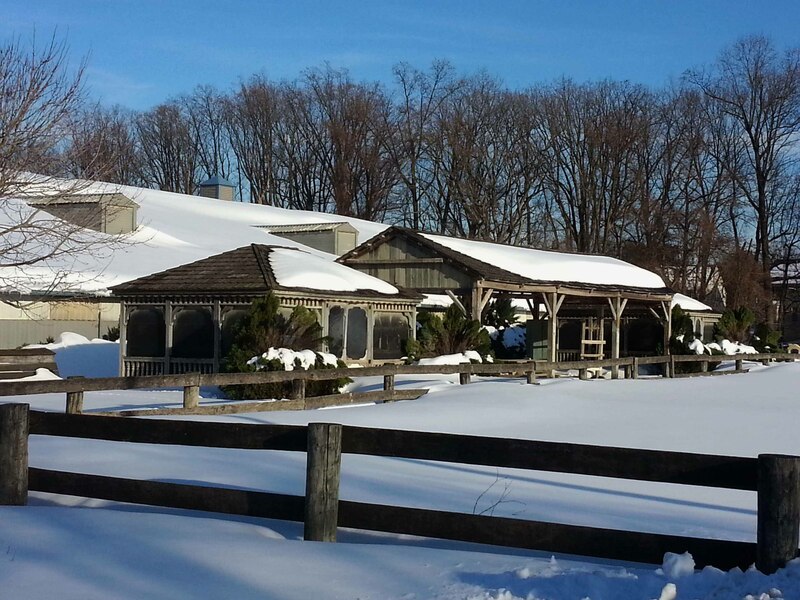 • The barn will be closed if Howard County has an emergency plan in effect. NOT just when schools are closed. • Students, working students, and staff: Dress warm with lots of zip-up layers, gloves and hats. No scarves while riding. • Please, call the barn if you are going to miss your lesson. • CHC has a very liberal make-up policy. • There are several make-up lessons to add in to. • All make-ups should be completed before the expiration date. Category winners, along with a few runners up, will be seen on the website and receive fabulous gifts and prizes! Roses are red, Violets are blue, Poetry is great, So participate!! Place entries in box in the barn office. Remember to write your name and age on all entries. Live music from Alan Scott Band! Games, volleyball, and our own BIG pool for the kids. Lots of food and beverages for everyone. Great for the family so come join us for a fun evening! 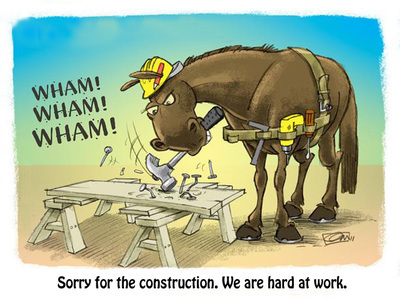 Excuse the noise and dust as we make improvements. There are several phases to the project and in the end, we will be getting much needed improvements. We will be operating as normal during this time. Thank you for your patience and understanding while we complete a much needed face lift. $115 for 45 minute private. Auditors welcome. Limited space available. Join some of the staff at Laurel Race Track at 5:30 to watch the race. Post time is 6:20. Details to follow. Student's friends & family welcome. Sign up posted in the barn office. Time to test your skills and have fun at the same time. Our students get a chance to show their family and friends what they have been learning in class. Sign up in the barn office. Flat or jumping. Trailer-ins welcome. $140 for approx. 60 minutes private. Auditors welcome. Limited space available. Trailer-ins welcome. Don't let the kids have all the fun! 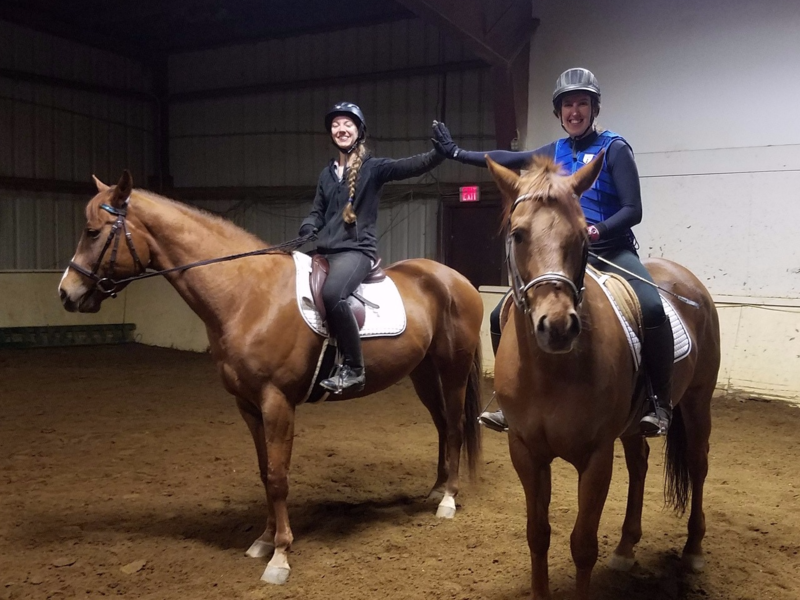 Come join us for 3 fun nights, learning about horsemanship, ride, and socialize! Paid in full at time of registration. Non-refundable, credit available. Call us at 301-776-5850 to sign up. Come join us for a fun, relaxing evening! 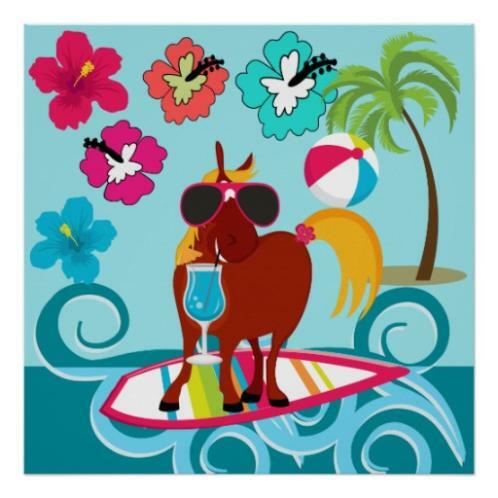 Enjoy a night with horses, friends, and good times! Pot luck dinner. No Horse fee. Casual attire. Open to CHC adult students. 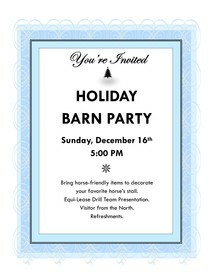 Sign up in the barn office or call us at 301-776-5850 to sign up. Show fees waived for those participating in all 3 nights of adult camp. COME PLAY WITH THE PONIES!! Horse related lectures and hands-on workshops. Fun and relaxed atmosphere to learn all about horses. Open to CHC students as well as non-students. Approved riding helmet and boots required. 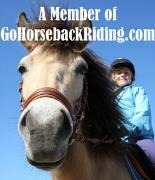 For all levels of riders ages 5-15. A fun evening for the entire family! Lots to do for the little ones! And, something scary for the older kids and young at heart! Sign up located in the barn office. Ride 2 times a day. 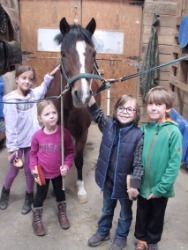 Children, ages 5-15, are introduced to the amazing world of horses. 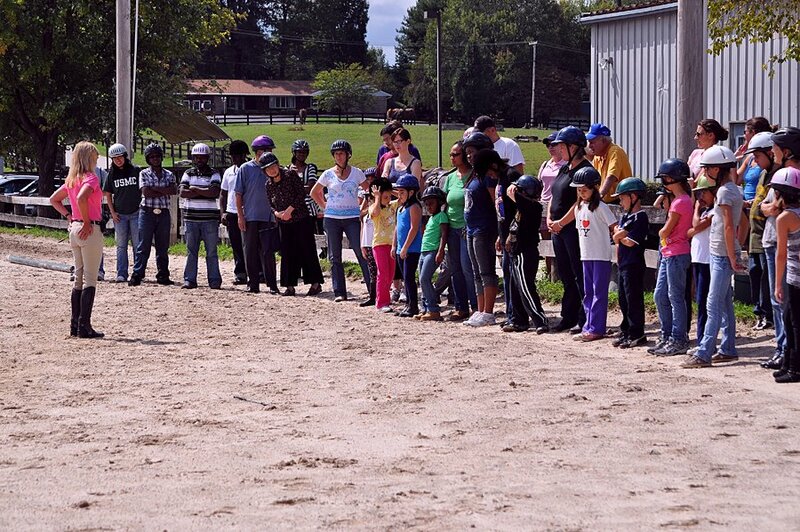 Campers ride twice a day and learn about horsemanship through lectures, games, and crafts. 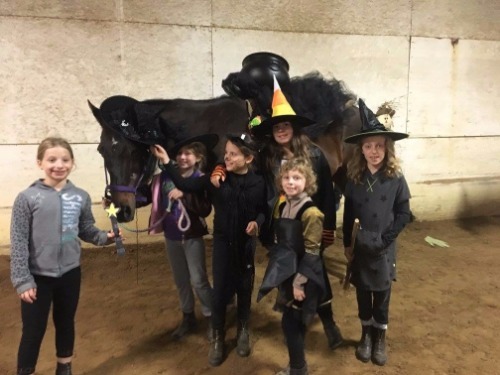 All levels of riders from beginner through advanced enjoy a fun and safe atmosphere while learning how to be around horses on the ground and under saddle. Camp runs Monday - Friday, 9AM - 4PM. 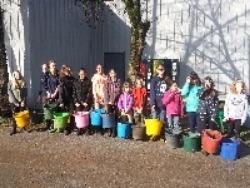 Looking for something for your child to do when school is out? Try out our One-Day Camps for $100.00. No experience necessary. Ages 5-15. Hours are 9:00 - 4:00 with before and after care available for an additional $30.00. Is your child taught at home? 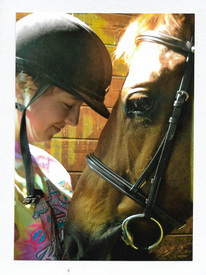 We offer riding lessons during the weekdays for those that stay home during the day. 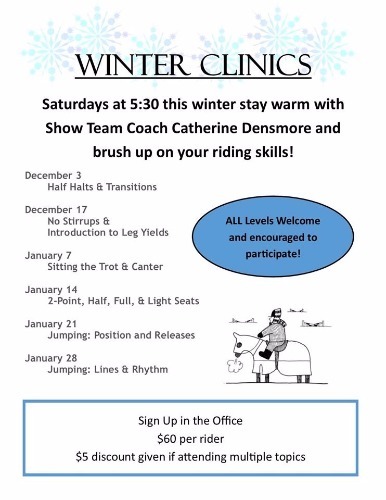 There are four 8-week sessions for all levels of riders from beginner through advanced. For more information, check out our HOME SCHOOL PAGE. What's going on at CHC? Check out our newsletter for great articles and updates. Follow us on Twitter to keep up with the latest news and updates. Sneak peek of our Holiday Barn Party from last night! What a fun evening!! Great job to our Equi-Lease Drill Team for another amazing performance at the Holiday Barn Party! The Techno Christmas was very entertaining!